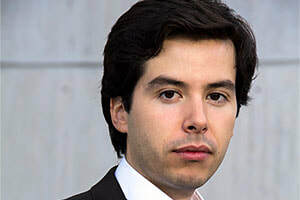 Conductor Alejandro Gómez Guillén is entering his second season as Artistic Director and Conductor of the Bloomington Symphony Orchestra. Newly appointed Associate Conductor of Fort Worth Symphony Orchestra, he also served as a Freeman Conducting Fellow with the Chicago Sinfonietta this past season. Recent and upcoming engagements include SingFest Hong Kong, the Bloomington Bach Cantata Project, the Weimarer Bachkantaten Akademie, the choral project ¡Canta, Bogotá Canta!, the Eighth Santander Choral Festival, the Cabrillo Festival, as well as a fellowship with SphinxConnect and a residency in his native Colombia with Batuta. This summer, Guillén returned to the Oregon Bach Festival as a member of the Berwick Academy for Historical Performance. Gómez Guillén previously served as Associate Conductor of the Boulder Symphony and as Music Director of the Mountain View Chancel Choir and Cantabile. An accomplished violinist on both modern and baroque instruments, Guillén was concertmaster of the Grand Junction Symphony Orchestra, the Amherst Early Music Festival, and the Junges Stuttgarter Bach Ensemble, with which he toured Germany and Italy in performances at the Rheingau Music Festival and the Berlin Philharmonie, among other venues. Committed to working with young artists, Guillén has served as Assistant Professor of Music at Colorado Mesa University and Music Director of the Colorado Youth Philharmonia. He has led performances with the Off Broadway School of Fine Arts in Boulder, the Javeriana University Symphony Orchestra, the Spokane Youth Symphony, as well as the Colorado University Symphony and Chamber Orchestras. Guillén's mentors include Gary Lewis, Helmuth Rilling, Matthew Halls, and Mei-Ann Chen among others. He holds DMA and MM degrees in conducting and violin performance from the University of Colorado at Boulder, as well as a BM in violin performance from TCU. When not playing, leading ensembles or reveling in the music of Bach, Alejandro spends his time singing, hiking, and making music with his lovely wife Sarah.